​Testifying before the Financial Services Committee this week, Secretary of Housing and Urban Development Ben Carson expressed support for the Federal Housing Administration and its new commissioner, noted that FHA has made “excellent progress” with reverse mortgages, and hinted that a new condominium final rule was in the final stages of completion. 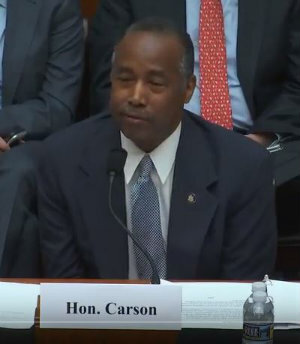 While being questioned by Rep. Blaine Luetkemeyer (R-MO) on the health of FHA, Secretary Carson was quick to point out that the agency “plays an extremely important function in our society” helping provide credit to low- and moderate-income people, first-time homebuyers and minorities. On the issue of condominium reform, Secretary Carson said a final rule could be published by September 2018. It’s a very important issue, he noted, because condominiums provide a gateway to homeownership, but it’s also a “complex issue.” View the hearing on YouTube.com.